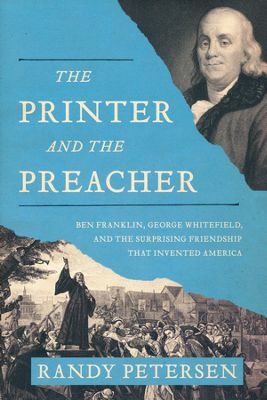 Randy Petersen in his new book “ The Printer and the Preacher” published by Thomas Nelson gives us Ben Franklin, George Whitefield, and the Surprising Friendship that Invented America. From the back cover: Social mobility. Religious freedom. Hard work over class. We take these values for granted, but colonial America had to learn them. How? Under the care and nurture of two remarkable men: a printer and a preacher. Preaching in public spaces across the colonies, George Whitfield inspired the first Great Awakening. Simultaneously, Benjamin Franklin was printing his own brand of common sense in Poor Richard’s Almanac. But the two were not just working in parallel; their stories were intertwined in a thirty-year friendship that spread their influence around the globe. This is the story of that friendship. Of how Franklin first printed Whitfield’s sermons, how Whitfield defended his friend’s diplomacy, and how their mutual regard allowed each to flourish and shape an ever-growing population. The Printer and the Preacher provides a model for our time: a friendship across differing outlooks with room for disagreement and mutual respect. And in the course of that friendship, a nation that was yet to be born was given its defining traits. I know a little about Colonial America. I know a little about George Whitefield. I know a little about Ben Franklin. When I found out that I could learn more about all three and how they worked together I jumped at the opportunity. Mr. Petersen has given us a well written, informative biography that brings the two men and America, at that time, to life. I started out knowing a little, I finished knowing quite a lot more. I felt that I had been transported back in time and I was walking the streets of the Colonies with these men. If you are looking for an excellent merging of Christian biography and Colonial American history then you have to read this book. I recommend this book highly.